Berkeley, CA â€“ 9 September 2011 â€“ In less than a month, Joshua Hale Fialov, the Eisner and Harvey Award-nominated writer of such critically acclaimed titles as DC’s New 52 hit I, Vampire, ECHOES, and Tumor, along with artist Brent Peeples (Grimm Fairy Tales), will begin to tell the story of the last of a race of super human beings that protected the Earth… until humankind turned against them, that is. 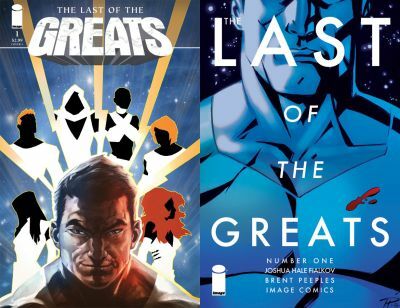 The first issue of THE LAST OF THE GREATS will have no ads, no former story continuity to sort out, and no filler—just 32 pages of quality storytelling. Fans of Fialkov’s other hit titles and new readers alike will surely be glad to discover this new series. In the tradition of alternate history epics like Irredeemable and Squadron Supreme, THE LAST OF THE GREATS combines adventure and action with dark humor. It’s the type of daring storytelling that Image Comics is known for. THE LAST OF THE GREATS #3 (AUG110409), a 32-page full-color sci-fi superhero comic for $3.99, along with a Phil Hester variant cover (AUG110409), will be on sale in stores October 5. For more information, a full PDF of the series, and a very special retailer incentive, Fialkov invites retailers to contact him through Twitter @JoshFialkov or via email at Josh@thefialkov.com.